Do you love garlic? 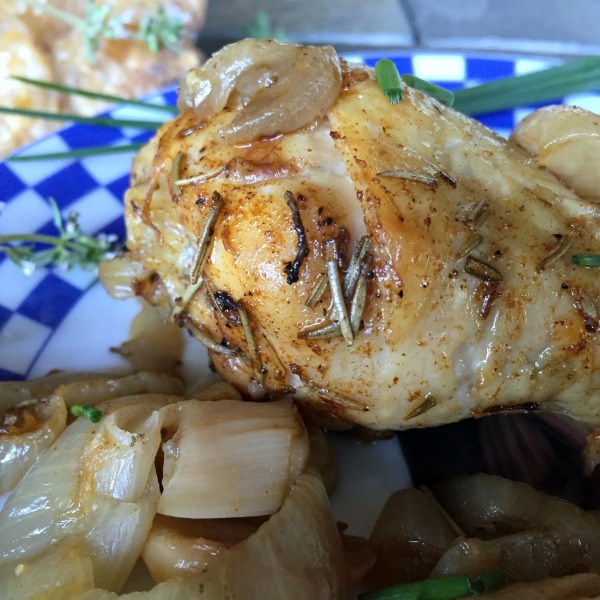 If so, boy do I have the Slow Cooker Garlic Chicken Drumsticks recipe for you! This one plays on the traditional 40 clove garlic chicken recipe, but uses uber-affordable drumsticks rather than a whole chicken. Here you’ll take advantage of your slow cooker to infuse your chicken with garlicky flavor — and then finish everything off in the broiler to add some nice browning and an extra level of caramelization to the garlic and onion. Drumsticks are on sale this week (and are on sale somewhere about every week…), making them the perfect fit for our June 11, 2017 edition of Sunday Scratchups: Your weekly recipe from scratch around ingredients that are either on sale or generally affordable. It’s fun to play off this humble cut of meat with some unexpected elegance, and then you can optionally garnish with fresh herbs from your garden for extra brightness. 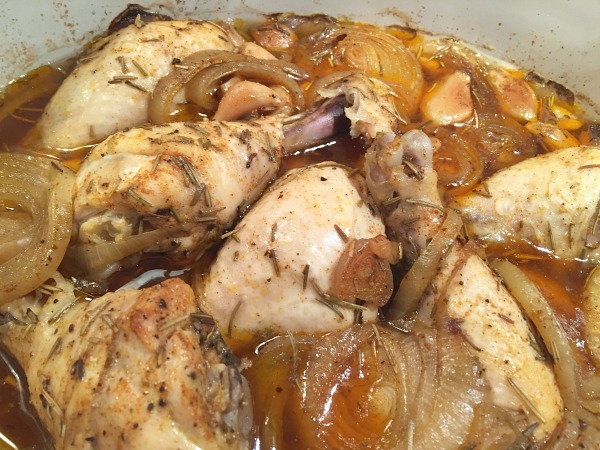 Place drumsticks, onion, and garlic in large bowl. Combine olive oil, rosemary, paprika, salt, and pepper in a small separate bowl, then pour over the chicken/onion/garlic and toss to coat. Add everything to your slow cooker, pour broth over, and cook on high for 4 hours. 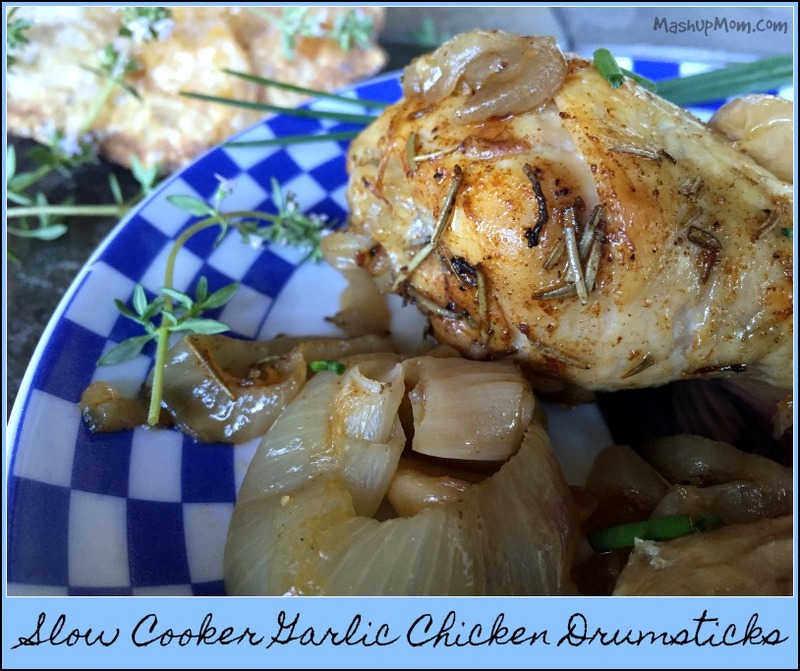 Use a slotted spoon to transfer drumsticks, onions, and garlic to a sprayed roasting pan, then broil on high for three minutes a side until skin is golden brown. Note: This is pretty garlicky — if you have ever had that 40 clove roasted chicken, you’ll know what I’m talking about. If you aren’t a fan of too much garlic, you can cut way back (try 5-6 cloves) — it should still be darn tasty, but with less garlic flavor. Garlic fans: This is the recipe for you. Mr. 10 loved the juicy chicken drumsticks, but was also picking out all of the garlic cloves and eating them. (They’re also soft enough that the non-low-carb contingent can also spread them on bread or add them to a baked potato!) Your drumsticks should be falling off the bone, but have a nice browning from their trip through the broiler. Serve your Slow Cooker Garlic Chicken Drumsticks along with their accompanying slow cooked garlic and onion, then add a green veggie or salad for a complete low carb, gluten free, comfort food meal. 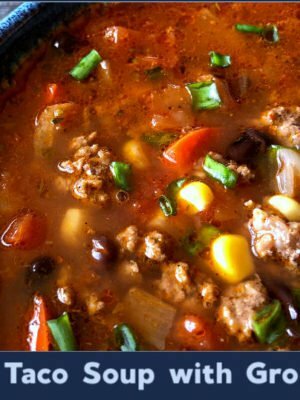 I used my seven quart Crock-Pot for this recipe, but a smaller one would also do here. Do you love garlic? 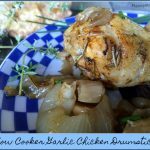 If so, boy do I have the Slow Cooker Garlic Chicken Drumsticks recipe for you! This one plays on the traditional 40 clove garlic chicken recipe, but just uses uber-affordable drumsticks rather than a whole chicken. Here you'll take advantage of your slow cooker to infuse your chicken with garlicky flavor -- and then finish everything off in the broiler to add some nice browning and an extra level of caramelizing to the garlic and onion. This is pretty garlicky -- if you have ever had that 40 clove roasted chicken, you'll know what I'm talking about. If you aren't a fan of too much garlic, you can cut way back (try 5-6 cloves) -- it should still be darn tasty, but with less garlic flavor. 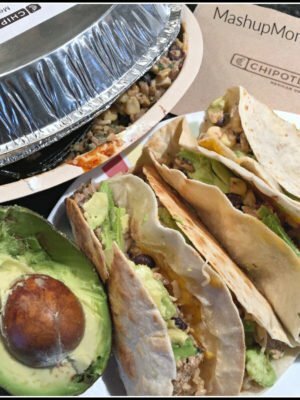 Low carb, gluten free. This sounds and looks delicious! Thanks so much for sharing ? Thanks I’m cooking his today! 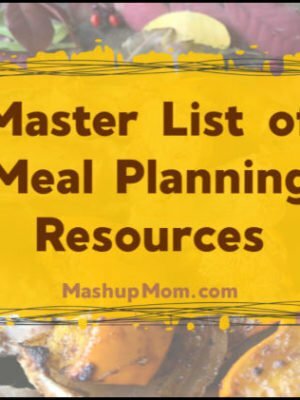 I love this recipe, and so does my whole family – even the ones who don’t usually like dark meat! I cannot recommend it highly enough. I make at least once every week or two and it’s always happily received. 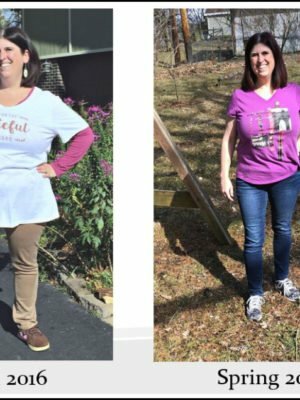 This might be the only recipe I’ve ever used where I don’t make any changes or adjustments. This is in my crockpot now. Can’t wait to eat this!